Phase response curves convey information about how a single neuron responds to input. When a constant, “baseline” current is injected into a neuron, the current typically induces the neuron to fire periodically. If only this baseline current is applied, the time between successive action potentials will be some value T. If, however, a short (relative to T) pulse of current is injected into the neuron in addition to the baseline current, the following action potential will in general not occur a time T after the previous action potential. This perturbation of the neuron’s period is called a phase shift. If the new period is referred to as T’, then the phase shift is mathematically defined by the equation Δ θ = (T–T’)/T. So the phase shift is positive when the current pulse induces the neuron to fire sooner than in the unperturbed case, and it is negative when the current pulse induces the neuron to fire later than in the unperturbed case. The phase shift depends upon when in the neuron’s oscillatory cycle the current pulse is applied. Plotting the functional dependence of the phase shift upon the phase of oscillation at which the pulse is applied yields thephase response curve (PRC). Neurons typically exhibit one of two kinds of PRCs. As shown in the plots below, the first kind show positive phase shifts no matter when the current pulse is received. The second kind show negative phase shifts when the current pulse is received early in the oscillatory cycle, and positive phase shifts when the current pulse is received late in the cycle. It turns out that neurons showing this second kind of PRC generally synchronize better than those showing the first kind of PRC. In addition, a given neuronal PRC will change as the firing frequency of the neuron changes, a phenomenon which generates many interesting effects upon network spatiotemporal patterning. Oscillations play an important, yet poorly understood role, in numerous cognitive processes in the brain. 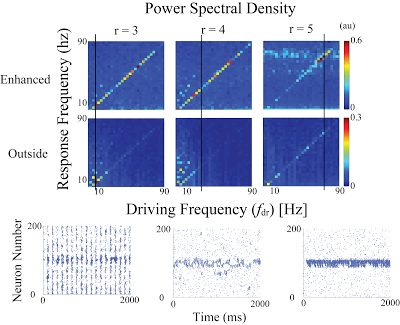 We have two projects which seek to understand the role of oscillations in the brain. The first is understanding the interaction of oscillations and the network topology. We have discovered an interaction between the frequency of oscillation and the connectivity strength of a heterogeneous neuronal network. Specific connection strengths and frequencies can selectively active specific regions of the neuronal network (above). The second project is on understanding the single neuron resonance frequency shift and it’s role on encoding memories via enhanced STDP. This project is focused on investigating the effects of distance dependent synaptic delays on the activity and synchronization of these same models.